You're on Day 9 of the 30-Day Gym-Free Fitness Challenge. To return to the main challenge page, click here. The time it takes to finish today's workout is completely up to you. Your legs will feel like jelly by the end, but you can probably knock it out in just 20 to 30 minutes. If you're not familiar with a "pyramid workout," you're in for a treat. You'll perform 10 rounds of the four-exercise circuit continuously, starting with 10 repetitions per exercise. On each subsequent circuit, you'll perform one fewer repetition per exercise, counting your way down until you only perform one repetition each on the final round. In other words, you'll do 10 reps of each exercise, then start over, doing nine reps of each, and so on. So it's a lot! Take water breaks between circuits if you need to, and if you just can't make it all the way through the full pyramid, make a note of which round you stop on. 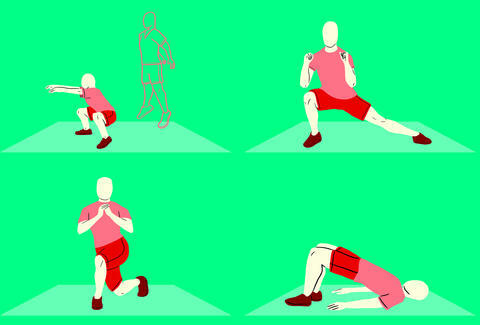 You'll do this workout again later in the week, so you'll want to try to beat your performance, either based on how much you complete, or the time it takes you to complete the whole thing.